What a lovely garden. 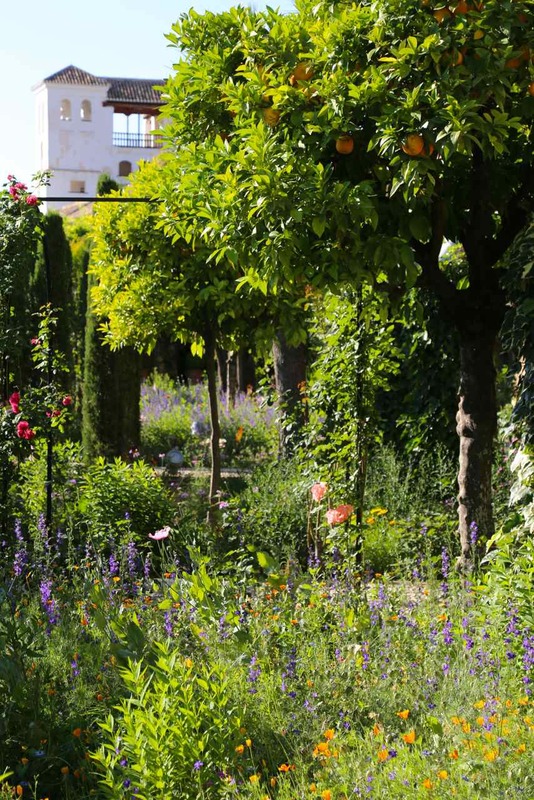 I pinned it onto my list of Gardens I want to see and touch : ) Thank you for sharing! I have one of those lists Laurin, its getting longer by the year, I can relate to see and touch too, I have looked at lots of photos of these gardens and felt very lucky to have finally visited. 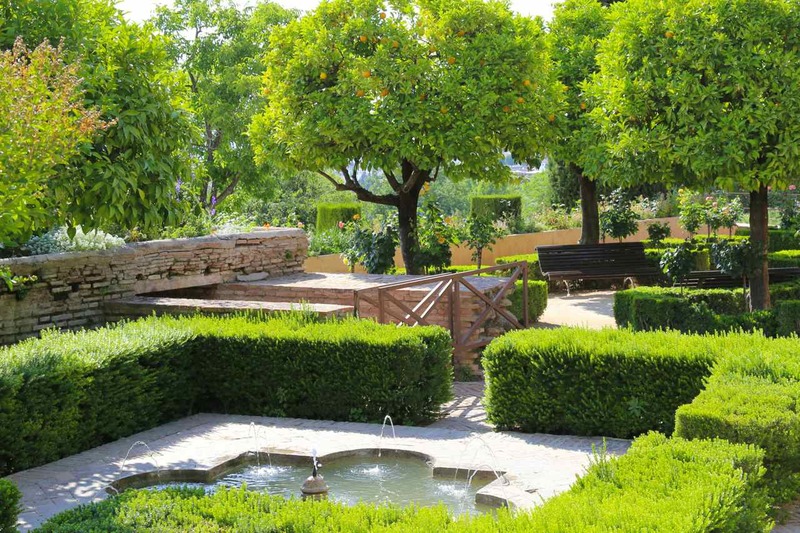 I am dying to see this garden – I would so love to visit when the orange or pomegranate trees are blooming. I love the use of water, the architecture and history here … some day we will get there. I loved the history side – really fascinating, so many changes over the centuries. 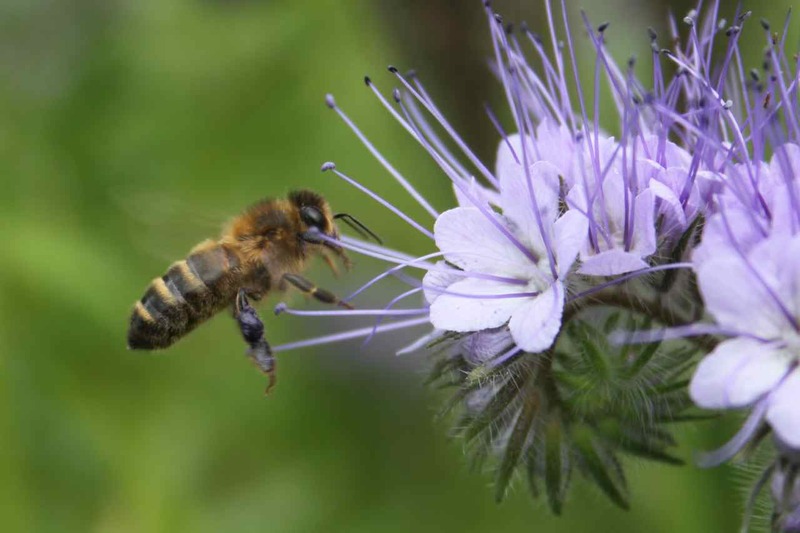 On the Alhambra web site there is a detailed list called ‘plant of the month’ which would give you a good idea of what is in flower when. Coming from the UK, the Orange trees were especially wonderful to see. Such a beautiful place! Your photos are so good Julie, I can imagine walking along those paths and sitting under the trees. I wish we had made more time to sit down and let the world go by as we came back feeling quite tired and in need of another break! There was so much to see we packed a lot into each day, very glad we went of course. That is the trouble with short breaks and also visits to museums etc. So much to see, so little time to see it in! That looks fabulous. 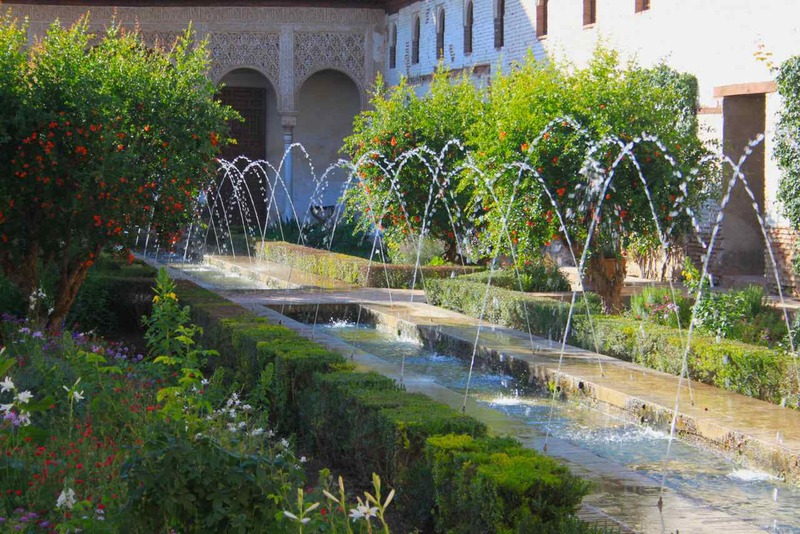 The sound of the water and scent of the roses and the orange trees must be magical. A place I would now love to visit. There were lots and lots of Roses and Orange Trees, I am so used to the supermarket stuff that seeing oranges on beautiful trees was quite thrilling. Frances from Island Threads has been telling me of some beautiful walking places in the Sierra Nevada, we hope to go again and combine both. What a beautiful place to visit. I wonder, do they harvest the oranges/pomegranates or any other fruit that’s grown? I smiled when you talked about trying to find shade–I would imagine that Spain was a bit hot for you? Folk from the UK do not cope well with any extreme of temperature! We grind to a halt with a little snow and train tracks and roads melt if the thermometer hits 30 (86f). 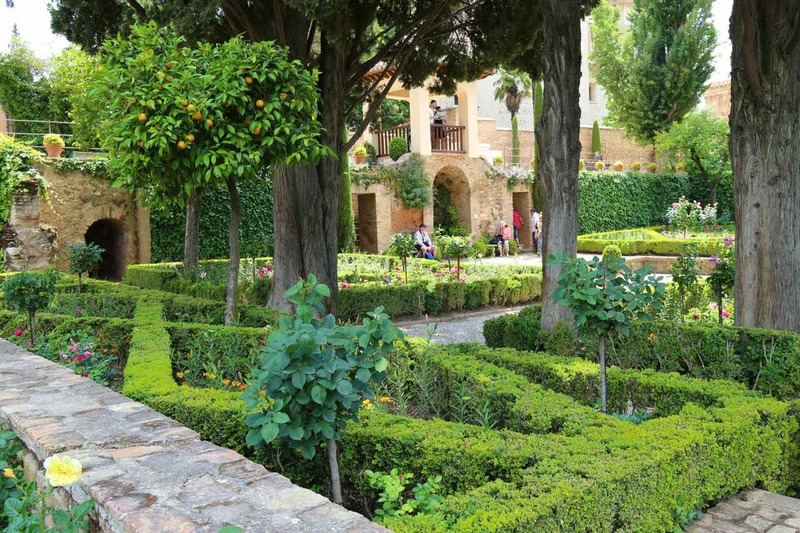 I read on the Alhambra site that the Pomegranates in the Partal gardens were the pleniflora cultivar colourful flowers and no fruits. 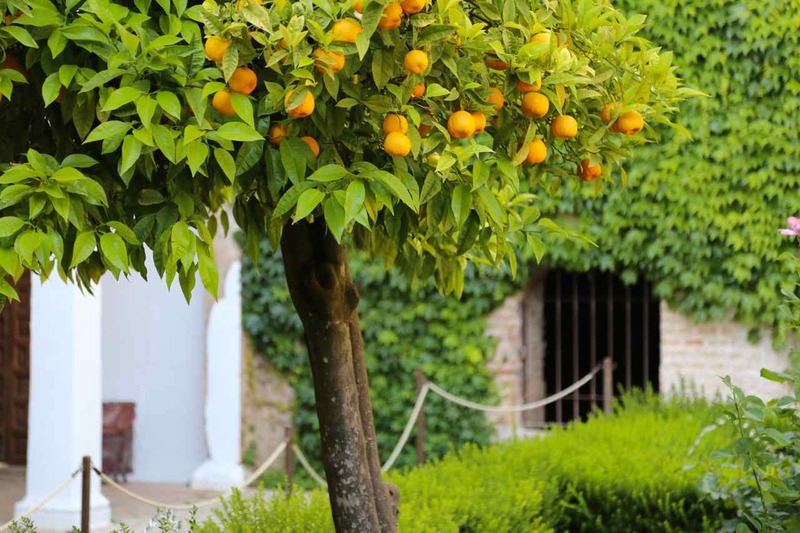 However the Oranges were so plentiful in Granada, we had juice every day at breakfast that was so delicious and fresh. As we flew in there were field upon field of Olive trees and we visited a market where there were lots of local lemons. Another lovely post – I’m so enjoying this virtual tour! 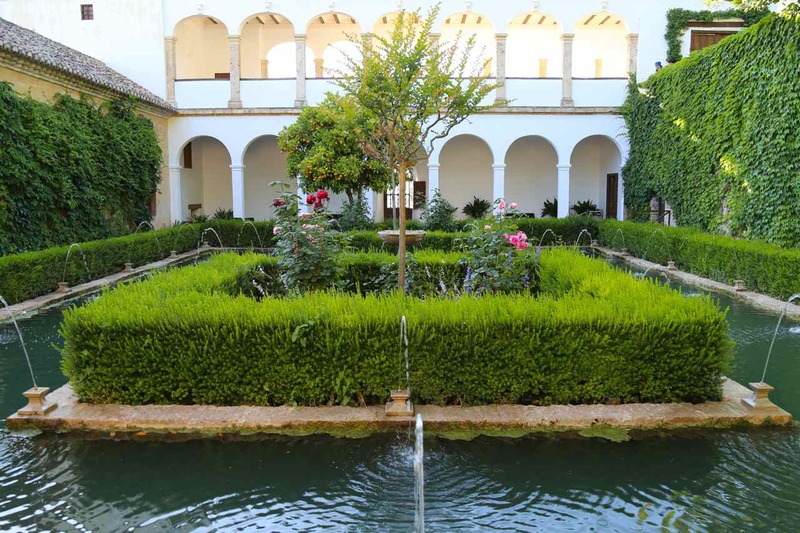 My husband worked in Cadiz over the winter and I think I had phantasies that I might visit the Alhambra for the first time this spring/summer. 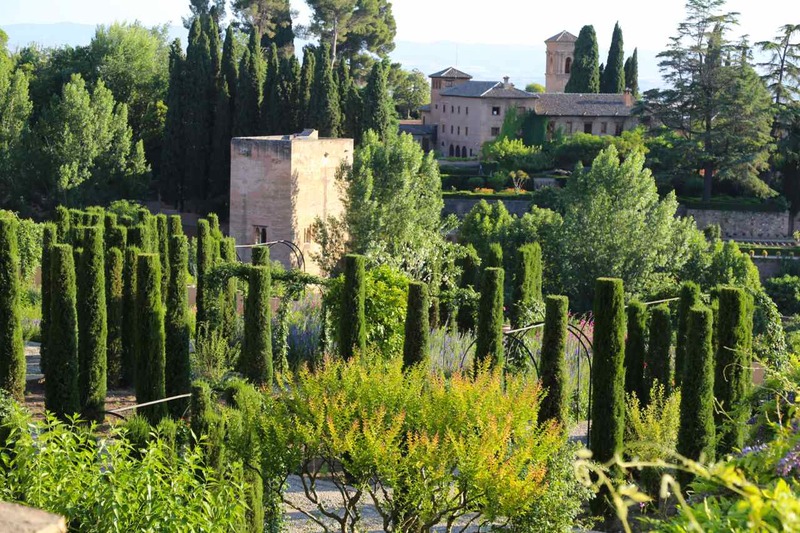 I can still do it thanks to your posts … those cypresses spires around the Tower of the Princesses are amazing, glad they are looking into saving the plantings. I found the continued development of the new gardens really interesting and loved the thought they too will be historic gardens in time. Hope you do get to visit Cathy. 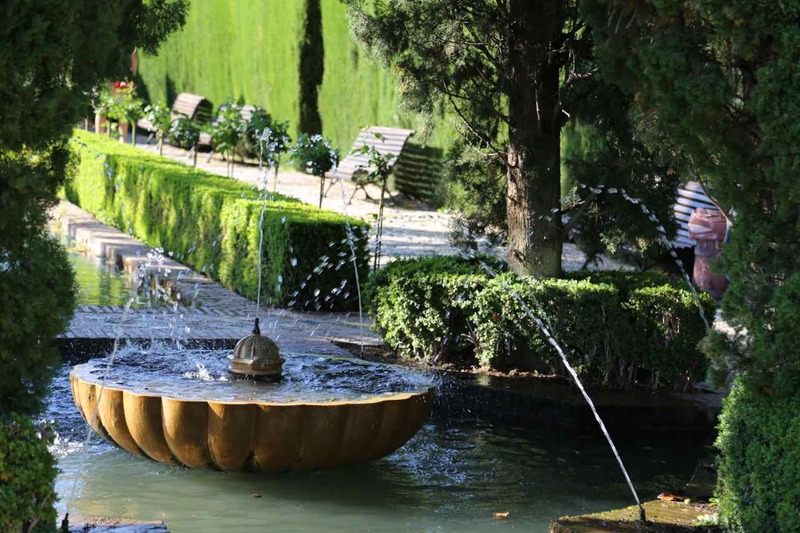 A fantastic record of what look stunning and extensive gardens, and really impressive for you to get people free images of them. I really liked all the use of water, but also the loose new look garden design … a little reminiscent of some of the effects in parts of Monet’s garden, though more relaxed plant choices. 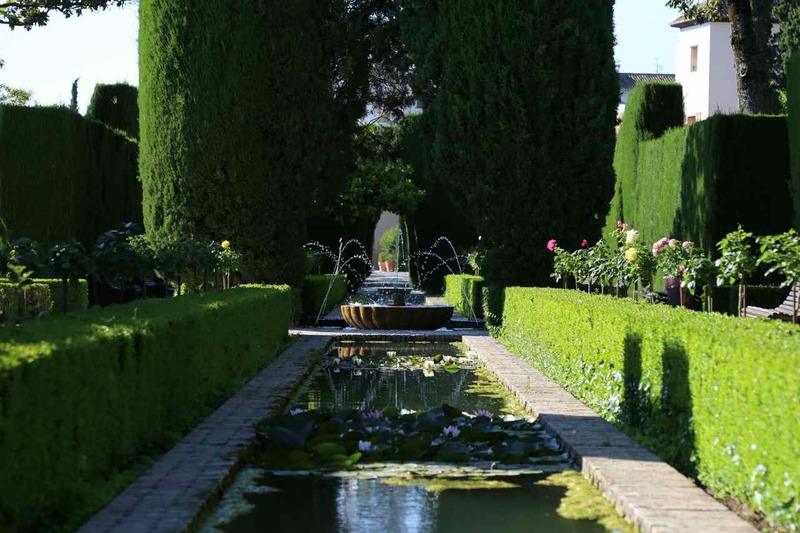 I wonder having seen this garden if Veddw was inspired by this garden(?type) with the use of hedge enclosed spaces, and water, though I know that there are many British gardens which also use such devices. I felt lots of people must be inspired by a visit here. I did not show the wonderful historic paths of cobbles laid in beautiful shapes, I had seen that before on show gardens and finally when we saw it here, I knew what had inspired people to do the same. No need to go Chelsea again, just come here! We loved our trip there Cathy, looking forward to going back and discovering the Sierra Nevada mountains. 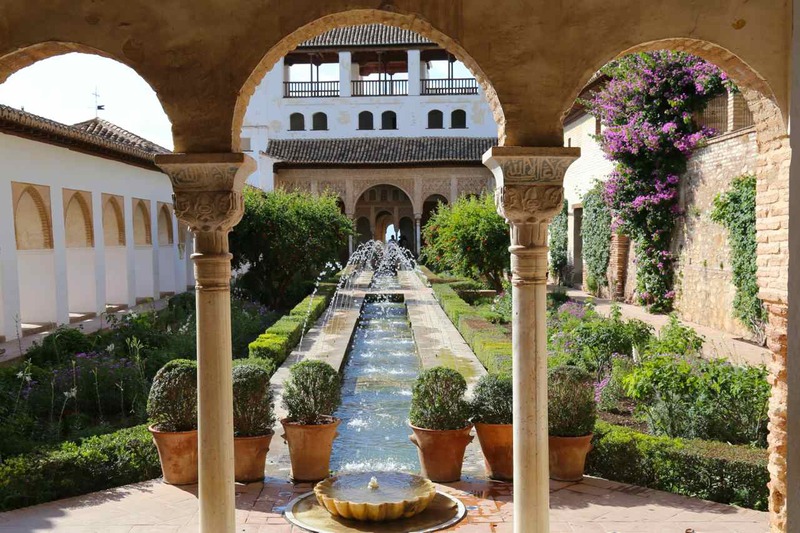 I struggled with putting the Alhambra into context as its so much more than the original buildings and gardens and there has been many changes. Irvin’s book was very helpful. The new gardens are evolving, I wasn’t able to find a guide book specifically on this area to research before we visited but found the audio guides most useful when we were there. I can really relate to your spiritual feeling, I like the connectedness (is that a word) of laying a hand on an old tree. And so thats why the oranges were still on the trees, that does make sense, we had wondered! I will take your advice too, our next visit will be in Spring. Thanks again Frances for your suggestions. I loved all of those things too Matt, I have pared it down for my posts, there is so much to see but the Orange Trees were particularly wonderful. Frances from Island Threads tell me the oranges are seville and bitter to stop folk helping themselves! All so lovely, but I was really taken with the loose effect. What fascinating place to visit. It’s so beautiful. Thanks for taking time to share this with us. Thank you for the two posts, descriptions and photos of these gardens. I didn’t know anything about them until reading your blog, Julie. Isn’t it the beauty of the blogging world that we can share each others experiences like this. Yes blogging opens my eyes to so many things! Oh my-thank you for sharing-those orange trees are amazing! Yep! Loved those Orange Trees, but hear they plant a bitter variety to stop folk picking them! Such lush beauty! Hoping to visit this summer. How lovely, I’d love to go again as there is so much to see, I’m sure you will love your trip.